Since some gel polishes weaken nail beds during the removal process (it requires an acetone soak and a metal tool for scraping), opt for a manicure with a less aggressive end. 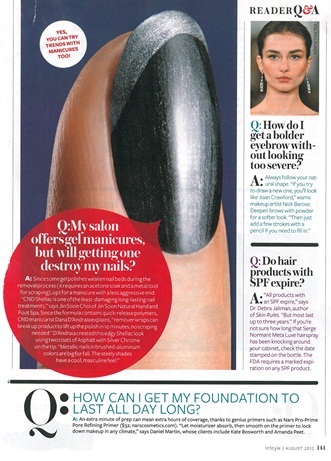 "CND Shellac is one of the least-damaging long-lasting nail treatments," says Jin Soon Choi of Jin Soon Natural Hand and Foot Spa. Since the formula contains quick-release polymers, CND manicurist Dana D'Andraia explains, "remover wraps can break up product to lift up the polish in 10 minutes, no scraping needed." D'Andraia created the edgy shellac look featured in the leftmost image using two coats of Asphalt with Silver Chrome on the tip. "Metallic nails in brushed aluminum colors are big for fall. The steely shades have a cool, masculine feel."